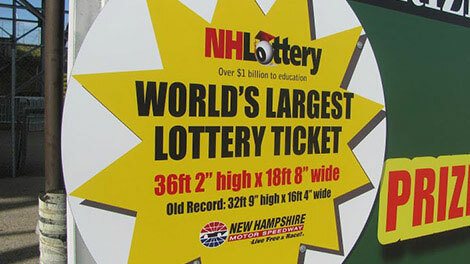 Back in 2011, the New Hampshire Motor Speedway (NHMS) and the New Hampshire Lottery created the World’s Largest Authentic Scratch Lottery Ticket in the hopes of grabbing a coveted position in the Guinness Book of World Records. 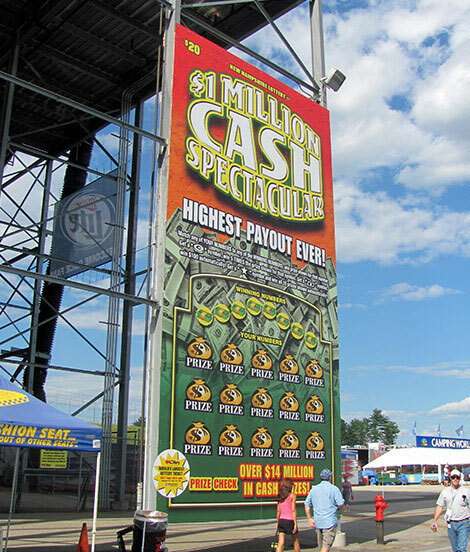 With strict guidelines from Guinness, and even stricter time constraints, AMI Graphics was commissioned for the project utilizing their signage and graphics expertise to approach the challenge. 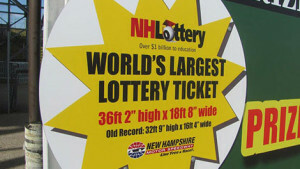 With large format and extensive graphics capabilities, the team at AMI constructed a 36.2’ feet tall by 18.8′ feet wide Dibond display using a UV printer, CNC router, and special adhesive to replicate the “scratch” component of the ticket.